….Khamenei dodged the questions and instead called Vahidnia dishonest. He claimed that he receives (and is receptive to) criticism every day, and that he always adjusts his behavior to account for errors. 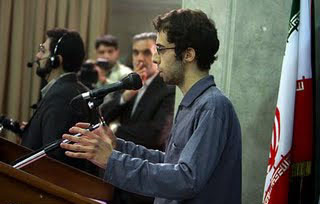 Soon thereafter, Khamenei departed behind a curtain before first receiving praise from a Basiji student in attendance. The prayer that Khamenei was scheduled to lead at the end of the ceremony did not occur amid his hasty departure. Actually, Vahidnia doesn’t even seem to have been on Iran’s IMO team, let alone a winner, but whatever. Apparently he really did deliver a 20-minute critique of Khamenei and his administration in front of a considerable audience. Why Khamenei allowed something like this to happen is a little hard to fathom, but it goes to show that the shockwaves from this summer’s demonstrations still haven’t died away.